Tim has been a volunteer investigator with the 2nd District (Ramsey County) Ethics Committee since 2014. The 2nd District Ethics Committee investigates complaints against lawyers. The role of the Committee is to investigate and report to the Minnesota Office of Lawyers Professional Responsibility (OLPR) which is an agency established by the Minnesota Supreme Court, to handle and prosecute complaints against attorneys, warranting professional discipline. 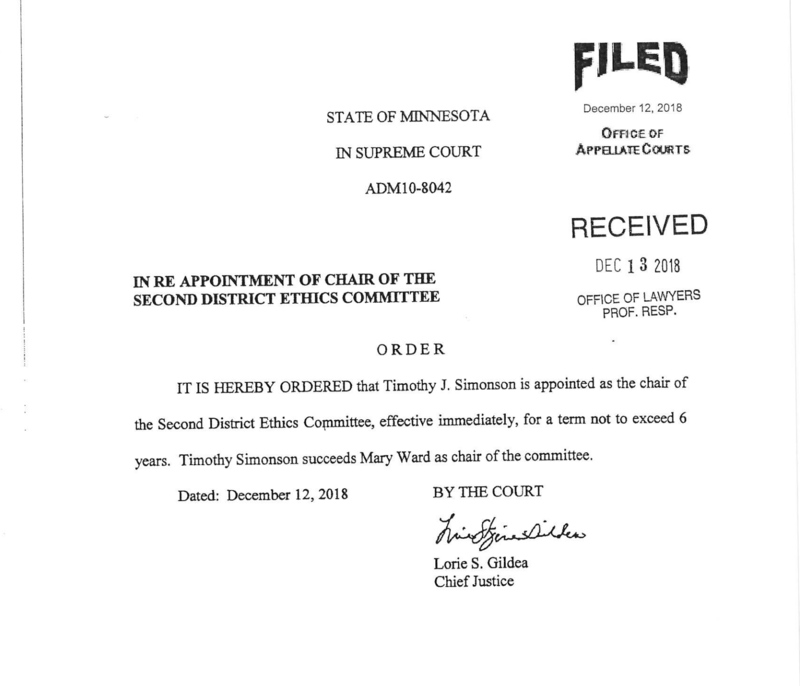 As Chair of the 2nd District Ethics Committee, for the next six (6) years, Tim is responsible for oversight of all complaints of lawyer misconduct in Ramsey County, assigned for investigation by the Office of Lawyers’ Professional Responsibility. Across the State, there are typically more than a thousand investigations opened each year, resulting from complaints of lawyer misconduct. Some of these investigations result in lawyer disbarment, suspension, probation, or reprimand.